An organization operating in the twenty-first century is different from one that operated during the Industrial Revolution. Today's focus is on optimizing human potential; people are the enablers of most aspects of intangible value. People develop relationships with suppliers, customers, distributors, and other third parties through which work is executed. 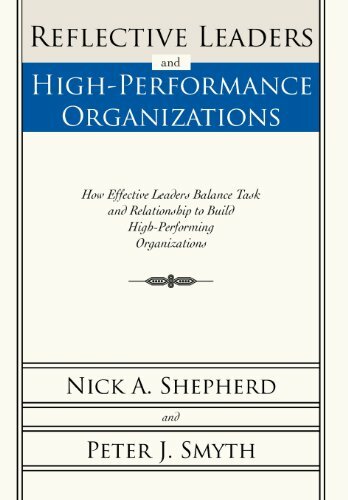 In Reflective Leaders and High-Performance Organizations, authors Nick Shepherd and Peter Smyth take an integrated view of organizational performance that blends a focus on both outcomes and relationships. Reflective Leaders and High-Performance Organizations suggests a framework for developing and applying an improved approach to organizational leadership and management. In addition to philosophy and conceptual approaches, it presents tested practical tools and direction. It also delivers case studies of organizations that have applied Shepherd's and Smyth's ideas and realized measurable improvements in the day-to-day activities of the organization, along with measurably improved outcomes from the organizational activity. Using over twenty years of practical consulting experience as well as careers in management, Shepherd and Smyth demonstrate how effective leaders can maintain a focus on organizational tasks and outcomes and do this while building and enhancing human relationships. About the Author&colon; Nick A. Shepherd has more than forty years of business experience. Since 1989, he has owned the management-consulting and professional-development company, EduVision Inc. which provides management-consulting and development services to public and private sector organizations. Peter J. Smyth has over thirty-five years of experience in the fields of adult education and organizational consultation, counseling, psychology, social work, and mental health. He holds numerous qualifications in the areas of teamwork, leadership, coaching, emotional intelligence, and personal and organizational assessment. Shepherd and Smyth have worked together for over twenty-five years facilitating workshops and helping clients enhance their teams and leadership capabilities. Shepherd, Nick A.; Smyth, Peter J.